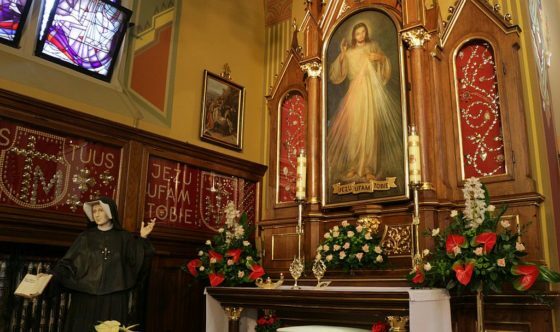 April 16th will be the 75th anniversary of the dedication of the graces-famous image of Merciful Jesus kept at the Shrine in Krakow-Łagiewniki. On the Feast of Mercy (the first Sunday after Easter) in 1944, the painting by Adolf Hyła, made according to the vision recorded in the Diary of St. Faustina, was blessed by Fr. Joseph Andrasz, S.J., the Krakow confessor and spiritual director of St. Faustina. The image quickly became famous for miraculous graces. Its copies and reproductions have been disseminated worldwide. In this way, the words of Jesus spoken to Sister Faustina at the first revelation have been fulfilled: I desire that this image be venerated, first in your chapel, and [then] throughout the world (Diary, 47). The image is a visual summary of the message of Mercy to the world, with which St. Faustina was entrusted. On the one hand, the image shows the merciful love of God revealed most fully in the life, passion, death and resurrection of Jesus. On the other hand, it reminds us of the human response to this prevenient love of God, which is expressed with an attitude of trust in Him (do His will) as well as mercy towards our neighbor. The pale and red rays which make this Image stand out symbolize the water and blood, i.e., the Holy Sacraments, which cleanse and nourish our souls. Happy is the one, Jesus said, who will dwell in their shelter, for the just hand of God shall not lay hold of him (Diary, 299). Jesus associated great promises with this trustful prayer while looking at the Divine Mercy image, combined with acts of mercy toward one’s neighbors: the grace of salvation, significant progress on the path of Christian perfection, the grace of a serene death, and all the graces and temporal blessings which are in line with His will. I am offering people a vessel, said Jesus, with which they are to keep coming for graces to the fountain of mercy. That vessel is this image with the signature: ‘Jesus, I trust in You’ (Diary, 327).